An excellent easy-to-read introduction to the sociology of New Religious Movements, notable for the 125 page discussion in Chapter Four: “Are Converts to new Religious Movements ‘Brainwashed’? which contains a 12-point critique of the concept of brainwashing’. In the 1970s a new occupation briefly emerged – that of ‘deprogrammer’. At this time, there was a widespread belief that emerging religious movements (such as the ‘Moonies’, which were prominent at the time) owed their converts to a programme of ‘brainwashing’. This implied that converts were not responsible for their actions. Deprogrammers took this belief to its logical conclusion, and were prepared (for payment) to kidnap people who had joined New Religious Movements and submit them to coercive ‘brainwashing’ tactics to remove their allegiance. Unqualified individuals set themselves as vigilantes, and their activities did at least as much harm as the new religions themselves. 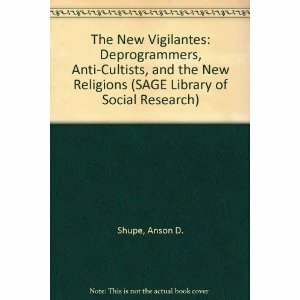 The authors critique the ‘brainwashing’ thesis, examine the strange period when anti-cultist ‘deprogrammers’ behaved at least as badly as the cults that they opposed, and consider the most appropriate response to the rise of controversial religious movements. The techniques identified by Lifton, on their own, seem to be ineffective in ‘ideal’ circumstances, and rely on having the victim under complete physical control. Consequently, ‘brainwashing’ does not explain personality change among Cult members who are rarely imprisoned, and never during the early stages of involvement.